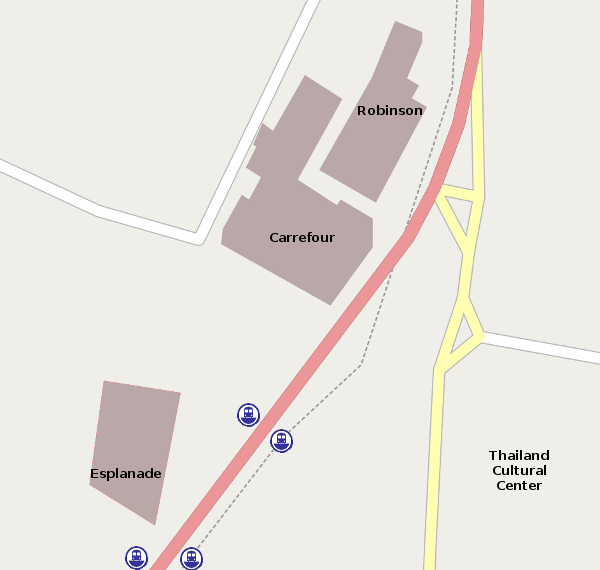 The Thailand Cultural Center Subway station is near the heart of the Ratchadapisek shopping area. This area primarily caters to locals, so there's not much here to draw visitors to Bangkok. However, if you're looking for some place to really cool off, the Esplanade shopping mall does have one of the few ice skating rinks in Bangkok. The other shopping centers are Carrefour, which also has a large home improvement center in it, and a Robinson department store. There's not much to draw you to the cultural center itself. It does host occasional concerts and offers classes in traditional Thai musical instruments, but it's generally a very sleepy place. The station is also the closest one to the Chinese Embassy, if you need to apply for a visa for onward travel. « Subway system main page.